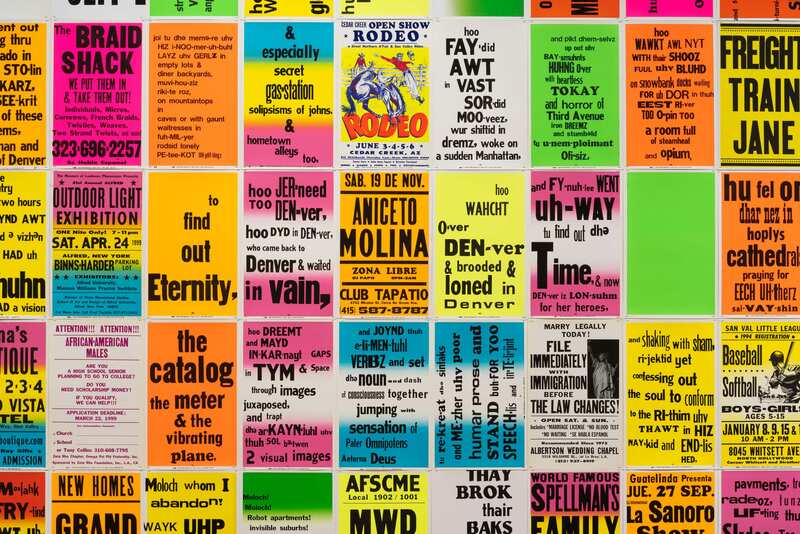 Allen Ruppersberg, 'The Singing Posters: Allen Ginsberg's Howl by Allen Ruppersberg (Parts I-III),' 2003/2005 (detail). Commercially printed letterpress posters. | Courtesy the artist and Greene Naftali, New York. | Photo: Courtesy Skirball Museum, Skirball Cultural Center, Los Angeles and Robert Wedemeyer. “Allen Ruppersberg: Intellectual Property 1968-2018” – the first comprehensive American survey devoted to the conceptual artist and Chouinard Art Institute graduate (1967) in more than three decades – opened at the Hammer Museum on Sunday, Feb. 10 and will be on display through May 12. Organized by the Walker Art Center in Minneapolis, the show features more than 120 works covering roughly 50 years of Ruppersberg’s career employing “elements of popular culture – newspapers, magazines, band posters and more – to create curious juxtapositions of image and text.” (Los Angeles Times). Works on display include photography, assemblage, print and more, on loan from public and private collections, many exhibited in the U.S. for the first time. Also on display will be the artist’s landmark participatory environments “Al’s Grand Hotel” (1971) and “Al’s Café” (1969) – a surreal restaurant staged in Downtown L.A. where diners were served inedible objects until it was shut down by police and the artist and waitresses arrested – which helped cement Los Angeles’ place as a capital of conceptual art. Born in Cleveland, Ruppersberg moved to Los Angeles in 1962 to attend Chouinard, intending to become an illustrator. During his early years on the West Coast, however, he became a key member of an emerging and influential scene of American conceptual artists exploring the interface of language, image, and mass culture alongside former CalArts colleagues John Baldessari (Chouinard ’59) and Ed Ruscha (Chouinard ’60), and others like Douglas Huebler (CalArts dean 1976-1988), William Leavitt, Allan McCollum and William Wegman. Organized into four parts, the exhibition examines major periods in Ruppersberg’s career: his earliest site-specific projects and photo works; works inspired by books and other writing; pieces demonstrating his process of translating the archival into art; and his later works memorializing fellow artists, including Robert Rauschenberg and Allen Ginsburg. “Allen Ruppersberg: Intellectual Property” will be on view with exhibition tours and public programs running throughout the spring. The Hammer Museum is located at 10899 Wilshire Blvd., Los Angeles 90024.